Retro and vintage logos are a hot trend these days, the Badge/Emblem Logo style is especially popular, and it’s no surprise why – they look great! ! In today’s tutorial, we’ll be learning how to create a retro badge background using Adobe Illustrator. So, let’s get started! 1. Create a blank document and set the Artboard dimensions to about 700 x 420px. Start by dragging a vertical and horizontal guide from the rulers. If the rulers aren’t showing on your screen, go to View > Rulers > Show Rulers. Select the Ellipse Tool (L) from the Tools Panel and position the mouse on the intersection point of the guides. Now click drag (hold down the mouse) to draw a perfect circle from the center out by also holding down Shift+Alt key. Set the dimensions of the object to 820 x 820px. Open up the Gradient Panel and fill the resulting shape with radial gradients: peach color (R=234, G=222, B=186) and deep bronze color (R=102, G=97, B=81). 2. Let’s create a vintage style sunburst. Grab the Rectangle Tool (M) and create a rectangle over the previous object, as shown below. 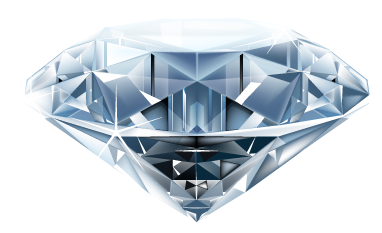 The dimensions of the object should be set to about 30 x 410px. Just make sure you align the lower edge of the rectangle to the horizontal and vertical guide’s intersection point. Set the fill color to dark red (R=153, G=38, B=38). Grab the Direct Selection Tool (A) and select the two lower anchor points of the rectangle. Right-click on the object and hit the Average… command, select both and click OK. The points will now converge prefectly together. We have inverted triangle now. 3. Keep the object selected, and find the central point of the guide we made earlier. Turn on the Smart Guides (Ctrl+U) and choose the Rotate Tool (R) from the Tools Panel. Hold down the Alt key and click on the central point of the guide. Once a dialog box appears, set the angle to about -10 degrees and hit Copy. Press the Transform Again (Ctrl+D) command repeatedly until you finish. 4. We are going to create a retro design badge now. Pick the Pen Tool (P) and draw a symmetrical shape, whose dimensions should be set to about 250 x 315px. Activate the Appearance Panel and pick dark cyan (R=0, G=106, B=130) for the “fill” attribute. Then, select the “stroke” attribute and apply a peach color to the stroke (R=234, G=222, B=186). The Stroke Weight should be set to about 3pt. We need to offset this stroke inward a couple of points. First, go to Effect > Path > Offset Path… and select an offset of approximately -6px and hit OK. Once done, click on the toggling arrow on the left to reveal the content of the “stroke” attribute. As you can see, we applied the effect to that specific attribute. While the object still selected, go to Effect > Stylize > Drop Shadow… and enter the values as shown on the image below. 5. We can add some text to the badge surface. I installed LT Oksana font, but feel free to use any font you wish. First, select the Type Tool (T) and write anything you want. If you want to follow this tutorial strictly, you could type the text as shown on the image below. Once done, fill the text with peach color (R=234, G=222, B=186). To make some further adjustments to the text, you can modify the type attributes by opening up the Character Panel. Grab the Rectangle Tool (M) and draw several vertical dividers in between the text, as shown below. To fill the objects, open up the Color Panel and pick the same color as we did for the text itself. 6. Let’s create a vintage style ribbon. Grab the Rectangle Tool (M), draw a rectangle and set the dimensions to about 315 x 45px. Open up the Gradient Panel and fill the resulting shapes with linear gradients: indigo dye color (R=14, G=83, B=114), prussian blue (R=2, G=66, B=89) and indigo dye (R=14, G=83, B=114), as shown below. Once done, make a copy of the rectangle we have just created. Using the Selection Tool (V), drag the right-center handle to the left to squeeze the object. Pick the Direct Selection Tool (A), select only the anchor points to the right and move them down a bit, to skew the object. 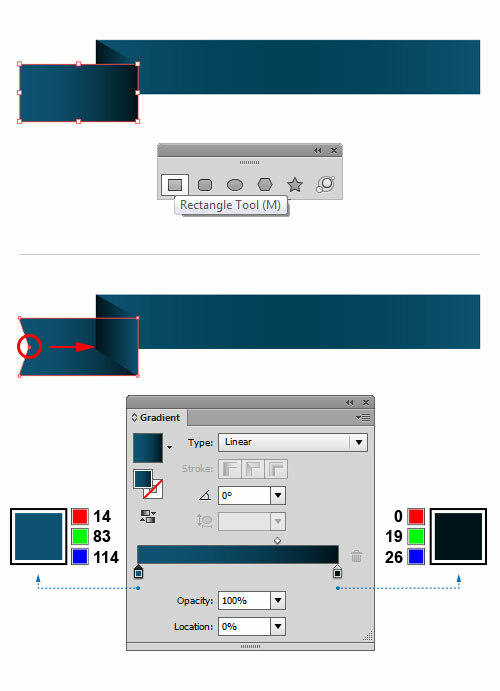 Activate the Gradient Panel and fill the selected object with linear gradients as follows: black (R=0, G=19, B=26) and indigo dye (R=14, G=83, B=114). 7. Let’s create a left side of the ribbon. Select the Rectangle Tool (M) and create a rectangular shape, whose dimensions should be set to about 100 x 45px. Pick the Pen Tool (P) and add another anchor point in the middle of the left edge of the rectangle. Simply grab the Direct Selection Tool (A), select the middle anchor point and move it 10px to the right. To finish, change the gradients the way you can see on the image below: indigo dye (R=14, G=83, B=114) and black (R=0, G=19, B=26). Send this shape to the back one step by choosing the Send Backward (Ctrl+[) command. 8. Grab the Star Tool, which can be found in the fly-out menu of the Rectangle Tool (M), and draw two different sized stars over the left side of the ribbon. Go to the Color Panel and set the color of the selected objects to peach color (R=234, G=222, B=186). When done, select the shapes as shown on the image below, and go to Object > Transform > Reflect… and click Copy to reflect the objects by vertical axis. Now move the objects to the right side, and position them accordingly. Pick the Type Tool (T) and then click in the middle of the ribbon. 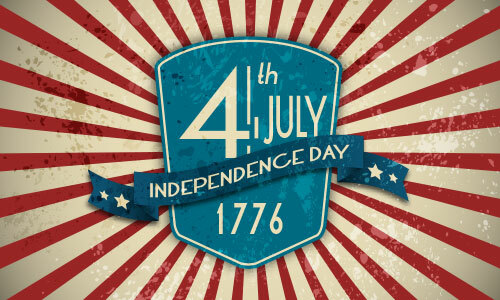 Once done, type in the words “INDEPENDENCE DAY”. 9. Select all the ribbon parts and the text we have created so far and group the objects (Ctrl+G). To distort the ribbon a bit, go to Effect > Warp > Arc… and the dialog box will appear. In the Style drop-down menu choose ‘Flag’ option and check ‘Horizontal’. The ‘Bend’ slider should be set to 70%. In the Distortion section keep the ‘Horizontal’ and ‘Vertical’ at their default values. Once done, go to Effect > Stylize > Drop Shadow… and enter the values as shown on the image below. 10. Let’s apply some splattered paint to our background. I use Free Vector Grunge made by Stanly. Select File > Place… and import the image into the document. Now we can start building our paint splatter area. Select first splatter and bring it to the background surface. Scale it down a bit (if needed) and place the object as shown below. Open up the Color Panel and fill the resulting shape with dark grey (R=46, G=46, B=46). Set the Blending Mode to Soft Light (Opacity 50%) in the Transparency Panel. Make a copy of the previous splatter and resize it a bit. Then, rotate the object and put it in its place. Keep the object selected and change the color to white (R=255, G=255, B=255). Activate the Transparency Panel and change the Blending Mode to Soft Light (Opacity 100%). Using the techniques described earlier in this tutorial, you can keep adding more splatters and texture until you get it how you like! You can apply a clipping mask to hide unwanted parts of the artwork. That’s it. I hope you’ve enjoyed this tutorial.